Kaleii houses reflect the peerless beauty of Turkish architecture. 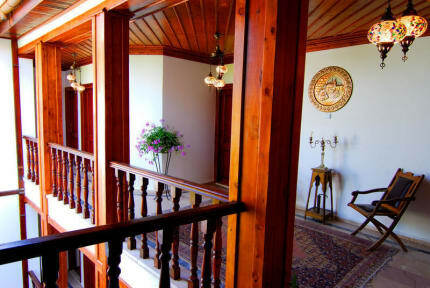 The White Garden Pansiyon is an example of the architectural style of the 'Kaleii' with 15 rooms and 30 beds. 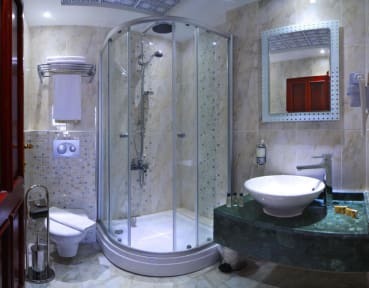 All rooms have private bathrooms with water heated by solar energy and direct telephone lines. Lonely Planet says: This quiet place has a nice garden and excellent prices for spotless,modern rooms. The freindly owner grills dinners every evening in the garden. Readers give a thumbs up for this great service. The Pansiyon features The White Garden bar and restaurant and a roof terrace. From the terrace you can see the beauty of the Toros Mountains and the Mediterranean Ocean. We look forward to welcoming you to the warm atmosphere of the White Garden Pansiyon. You can rent a car here! From 3 to 6 days car rental costs 30 Euros per day. From 7 to 13 days car rental costs 26 Euros per day. From 14 and more days car rental costs 23 Euros per day. Our prices include taxes, insurance, road asistances and free km.. We offer customers the very best insurance with our New Brand Model (FIAT OR RENAULT CLİO) airconditioned rental cars and reasonable prices. Knowing that you have good insurance will make your journey through Turkey more enjoyable and worry free. Antalya offers a number of activities relevant to most travellers. There are rafting tours, traditional Turkish Hamam's, English cinemas, internet cafe's, book shops, boat and yacht tours, billiards, bowling halls, water parks and daily tours (Perge, Aspendos, Termessos, Waterfalls etc. ), an array of shopping opportunities, including a daily Bazaar. This place is paradise. Just go!! I would simply add that the pictures of the rooms don’t really pay justice to the actual beauty of the place! It is a lodge style kind of decoration with very good taste. And the pool/garden area is incredible, best place ever. The location is also amazing. And the staff. Perfect, congrats!! Very nice hotel, lovely and helpful staff.